Just in time for NFL Kick-Off, Bud Light – the Official Beer of the NFL – is bringing a new 49ers Bud Light can to San Francisco. The new packaging features 49ers colors, as well as a slogan every 49ers fan can relate to: The perfect beer for using this can to recreate The Catch. 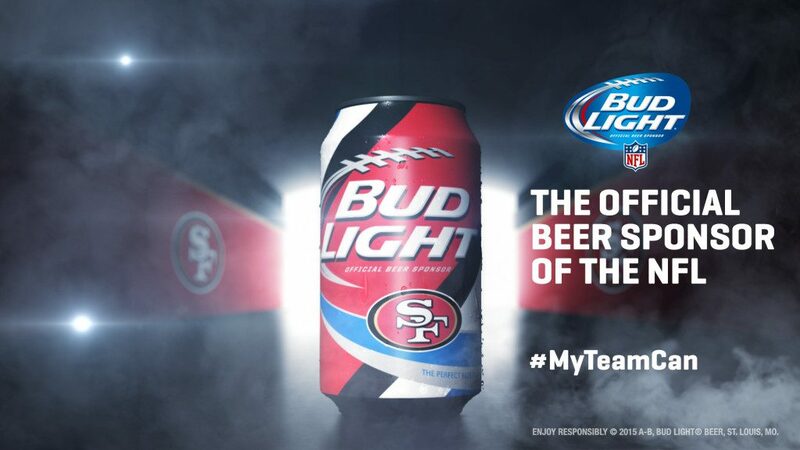 What do you think of the Bud Light 49ers can? 48 Comments on "Bud Light Kicks Off NFL Season With New 49ers Can"
One of the sharper looking cans in the series! I’m from Ohio born and raised but Red and Gold til I’m dead and cold.. I need this! I have them u can only mail empty. They’re bottom open 2 sm holes. 2.50 per can.3for 5.00 free shipping if u buy 3. 2.94 for one. I have 49ers can’s.I am waiting on Superbowl can’s should know soon. I’ll have super bowl cans next month. Any idea where they can be purchased in No.Calif? Any idea where they can be purchased in No.Calif bay area? I live in Pennsylvania and a Niners fan for life! How can I get a case of the 49ers bud light cans here in PA? 2.50 a can or 5.00 for 3. 2.94 shipping for one or free shipping if u buy 3. Where or how do i buy a case of San Francisco bud light cans if i live in Phoenix AZ. I have an 18 pack unopened, but it would probably cost a mint to send it to you. How can I buy 49er beer from you??? Trying to get a 6 pack or larger. How much are you asking? U can’t get them anymore is store but I still have some. 2.50 + 2.94 shipping or get 3 for 5.00 free shipping. 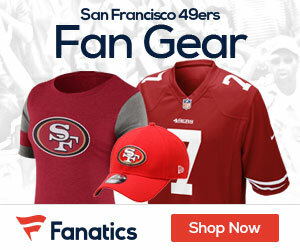 Or drive up to show low and I give it to u free.yes iam a real 49ers fan iam not trying to make a lot of money off these I just happen to be in CA when they were still in store and I pick up 2 30 pack’s.I have 10 left. I liveing outside of show low I have ten left.2.50ea + 2.94 shipping. Or 3 for 5.00 free shipping. Or if u r up this way call me I just give u one for free.yes I am a real fan.928-551-0064 Michael. I’m from Illinois and 9er fan from birth. I need a case. How can I get one? I have ten left u can only mail empty. 2.50 ea.+ 2.94 shipping. Or 3 for 5.00 free shipping. Look on eBay you’ll see iam not try to make a lot I was in CA when u could still get them and I got 2 30 pack’s I only have ten now. Please I am from El Paso Tx!! How can I purchase cans with the 49ers logo! Email me to: mmoral2567@aol.com. Thank you! Or call me at 915-873-8914. I have ten left $2.50ea + 2.94 shipping or get 3 for $5.00 free shipping. U can only mail empty 2 sm holes in bottom. How do we order these 49er bud light beer? Will they be sold in stores? U can’t get them anymore I have ten left $2.50 ea.+2.94 shipping or 3 for $5.00 free shipping. I live in ny, how can I buy these cans? Thank you! I have ten left @ 2.50ea +2.94 shipping or 3 for 5.00 free shipping. If anyone wants me to buy these and ship them to you shoot me a message. I have ten left I’ve been selling them on eBay 2.50ea +2.94 shipping. U can only mail them empty 2 sm holes in the bottom. 3 for $5.00 free shipping. I have an 18 pack unopened. I am going to get 2 of the 5 next month. I have 49er cans but u can only mail them empty they are bottom open 2 sm holes.2.50 + shipping. Let me know if u want any? I have ten left $2.50ea + 2.94 shipping or 3 for $5.00 free shipping. I have ten left $2.50ea + 2.94 shipping or 3 for $5.00 free shipping. U can only mail empty. There also coming out with Superbowl cans after 12/07/15 I’ll keep checking when I get some I’ll post on here. I have found super bowls 81 and 84 now…hopefully these cans last a longer time than up until the super bowl…I do b t know what kind of release schedule these cans are going on…anyone local to sacramento know where to get these cans ? Does anyone have this year’s cans looking for some for a friend. I live in NM so all we get here is Broncos.